After working together with Mark Neveldine in Crank and its sequel, Gamer and Ghost Rider: Spirit of Vengeance, Brian Taylor is back with his first solo effort: Mom and Dad starring Nicolas Cage and Selma Blair. For the first time, Taylor has ordinary people as protagonists, the titular mom and dad who are facing such issues as midlife crisis and parenting a rebellious teenage girl (Anne Winters) and a restless little boy (Zackary Arthur). Even if these situations are mundane, the real conflict of the film is pretty damn extraordinary, as is characteristic of Taylor’s genre cinema. There’s an epidemic, of unknown origin, that turns parents into ruthless killers, whose only victims are their own children. 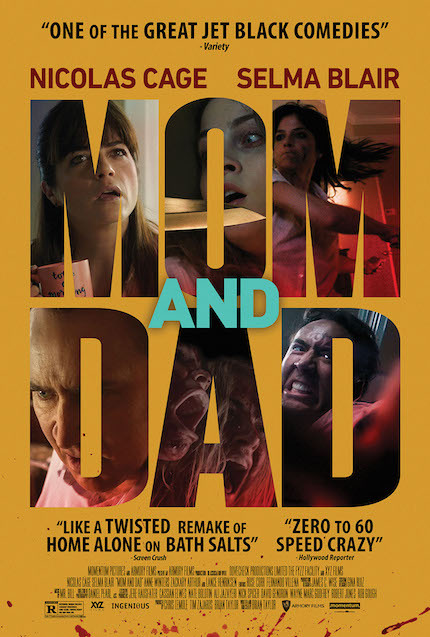 A horror/thriller movie with dark humor and another insane and fun performance by Nic Cage, Mom and Dad hits theaters, VOD and Digital HD on Friday, January 19. In honor of the release, here’s my interview with writer/director Brian Taylor. ScreenAnarchy: Why did you feel this was the right story to make your first solitary effort? Brian Taylor: It’s a movie that hasn’t been done before, so I’m always really excited by things like that, even though sometimes you find out that there’s a reason why it hasn’t been done before. That’s the chance you have to take. What was the greatest challenge of working for the first time without your partner Mark Neveldine? I don’t see it that way. There were a lot of challenges in this movie. We made it incredibly fast, in 24 days, and we didn’t have a lot of money. I first approached Blumhouse about this idea and they liked it but they wanted it to all be in the house, because that’s sort of their model: if we make the whole thing in the house then we can make it cheap and fast. I just felt it wanted to be bigger than that, it wanted to get into the school, it wanted to have that Night of the Living Dead feeling. It was a complicated movie to make but it was also a fun movie to make, because the team and the actors were great. You don’t really think in how hard it is while you are doing it, you just get so excited to go to work and see what Nic Cage and Selma Blair are going to come up with. This is a mixture of different things, there's horror, social commentary and certainly dark humor. How do you manage to mix these tones and make it work? It’s something that I’ve always done, it’s a big part of my style, if I have one, this idea of juggling tones a lot. It’s my nature, I’m always looking for the dark humor in any situation, and that’s just translates to what’s on the screen. Sometimes it’s to a fault and it’s like “why are you joking at a time like this?”, but it’s kind of the way I am. I don’t know another way to do it. The film doesn’t focus on the explanation, but rather on the consequences of the epidemic within the family. Why did you choose to do that? A big influence on this movie is Night of the Living Dead, the original, black and white one. I love that movie and I love that they never explain anything, it’s just a phenomenon, you just have to deal with it like you would in real life. There are some theories here and there of what it might be, but at the end of the day they never explain anything and you’re left with the characters and their reactions. I think there’s too much explanation in movies. Nicolas Cage is always bringing to the table something crazy and unpredictable. How was the creative process with him and how different from the last time you worked with him (GHOST RIDER: SPIRIT OF VENGEANCE)? He’s awesome. Everyday you work with Nic on set is like a gift from the movie God. You never really know what you are going to get, you just know it’s going to be fun. I’m just a big fan of that guy and I couldn’t imagine anybody else doing this thing. It’s the little things with Nic; we know that he can be crazy but the subtlety of the performance is the most fun for me. Why do you think genre cinema, if done right, is a great way to talk about real life problems, like in this case midlife crisis and the most difficult side of parenting? Genre takes issues like that, usually treated in metaphors, and makes them real. That’s the great thing about genre; we all have monsters in life to deal with, and in genre the monsters can actually be real monsters. When someone asked you about the genesis of the film at the Fantastic Fest screening, you just said, “well, I’m a father.” How personal was the story to you? It’s a universal truth. When we become parents we fulfill our whole reason for being, we procreate, and that’s sort of the meaning of our lives in a lot of ways. That works really well in nature, if you’re a fish or something, but as human beings we have a lot of resolutions of our own accordance and relevance. It doesn’t work as well with human beings so we end up with a messy, half-parent that don’t really feel that they belong. I think that’s the truth of any parent. We love our kids, it’s not their fault. Fantastic Fest 2017 Review: MOM AND DAD, Infanticide Has Never Been So Much Fun!